Lisa Newberry is deep within the grips of depression. She has recently lost her husband after several heartbreaking attempts to have a child. On top of everything, she is attacked by a robber in a parking lot. She is utterly without hope until she receives a strange letter. She is offered the opportunity to become a part of a new medical trial. The Cognoscenti company will implant a chip in her brain that will emit electrical impulses. The researchers believe that this chip will cure depression. The catch is that Lisa will not know whether she is implanted with a real chip or a placebo. Is it worth the risk? And what will be the side effects of this promising new procedure? Ms. Collins knows all about suspense and writing incredible twists and turns. Each time you think you have figured out what is happening, Lisa (and we as readers) find out that it can't possibly be what we thought. This book is full of intrigue as Lisa becomes a part of the shadowy world of pharmaceutical trials in which you sign away your right to fight and your fate is in the hands of an unknown few. The science presented seems entirely plausible, but the plot of the story is not overshadowed by medical jargon. It is easy to feel compassion for Lisa as you read Double Blind. You truly feel her desperation as she wonders how she will get through another day and then her exhilaration as she imagines a new life not darkened by depression. Depression is presented as a deeply crippling condition and I think Collins gives the illness the respect it deserves. Lisa is an engaging character and it is easy to cheer for her as she tries to leave her dark days behind her and search for the truth of what is going on with this medical trial. I also really enjoyed what this book says about relationships. From the beginning, we learn that Lisa has a very strained relationship with her mother. Collins paints a realistic picture of a daughter who feels she can never live up to expectations and a mother trying to do her best to support her child. The journey that mother and daughter go through during this story feels realistic on every page and I think it gives the reader hope that even the most broken bonds can be salvaged. Double Blind is a page-turner that will do that thing that the best mysteries do - keep you up at night. You want Lisa to finally get a break from all of the difficulties of life and find happiness. Her desperation is palpable because you want to find answers just as much as she does. Ms. Collins has written a realistic story about the pain of depression, the promise of science, the dark side of power, and a thrilling search for justice. 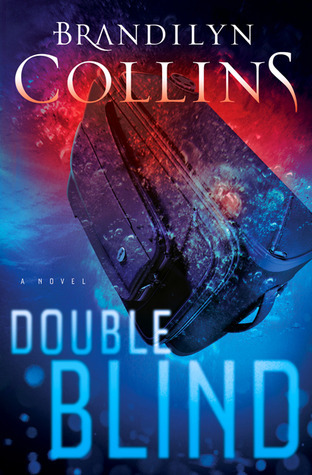 Want a copy of Double Blind for yourself? I am thrilled to be able to offer one copy of this book to a reader, courtesy of the DeMoss Group. If you want to win, leave a comment with your email address and let me know if you would ever get a chip implanted in your brain. I will announce the winner next Wednesday. To the ladies and gents of the FTC: I received this book from the DeMoss Group in exchange for an honest review. It's quick read. I think it's interesting because it seems so feasible. I could see something like this getting a trial in the next 5 or 10 years. I am very intrigued! If I were offered a chip in my brain to cure my anxiety/depression -- which runs rampant through my family -- I have to say it would be a hard choice. I can't give you a firm answer, but yes, I'd consider it. A medication-free life, plus the chance to learn about the pros and cons of a new treatment that might help my children and grandchildren someday. I found the idea so fascinating. Wouldn't it be wonderful if we could cure depression and other illnesses this way?